You can still the week two programming tonight. Not to mention two more weeks of theater/dance/neo-vaudeville. 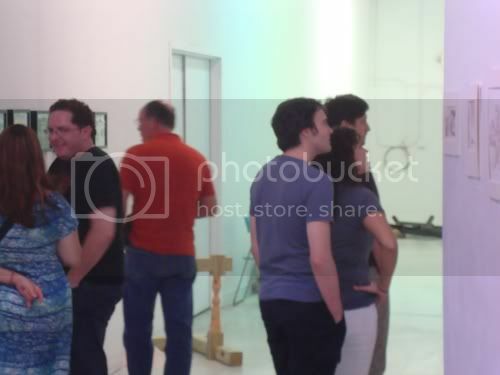 I went last night and took these photos of people checking out the art show (if the Fringe festival performances are the "circus," my art show is the "side show"). I hesitated before putting them up on Pan--it's a little masturbatory, you know. Hey look! 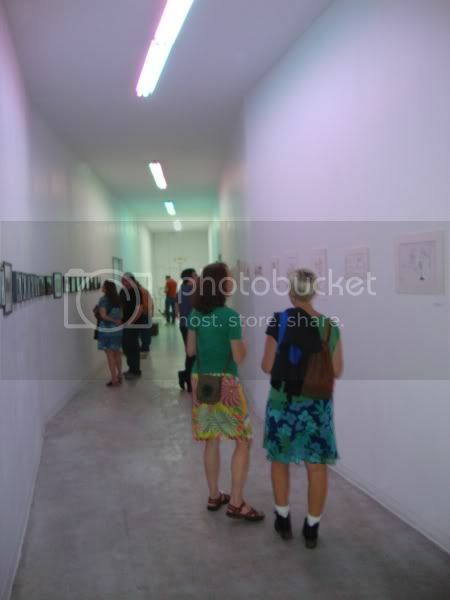 People checking out the show I curated! 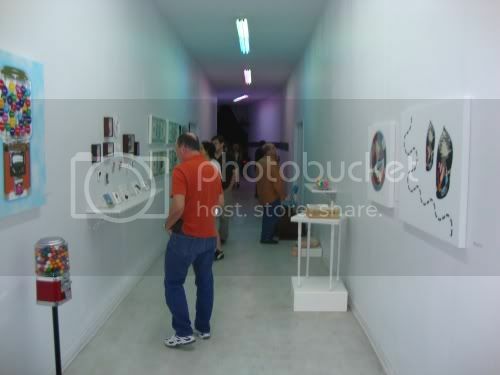 But I've never curated a show, and it's still kind of amazing that anyone looks. And gratifying. 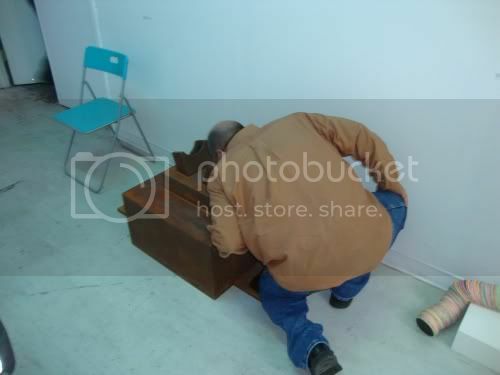 I love it when people really get down to check out the Woody Golden piece, Terra Antennae Prayer Box. The most amazing thing happened last night. I showed up late--I don't think anyone knew I was there. Certainly no one in the audience, among whom I was just an anonymous fellow theater-goer. So at the end of the first half, Rebecca French and Robert Thoth came out to announce the intermission and point out some of the "sideshow" things happening. They invited people to look at the art exhibit "curated by Robert Boyd" and the audience burst out into spontaneous applause. So look, I've never been a performer. But after last night, I understand the appeal. That applause made me feel very emotional. I'm usually filled with doubts and regret about my own work, but that was--for a moment--washed away. 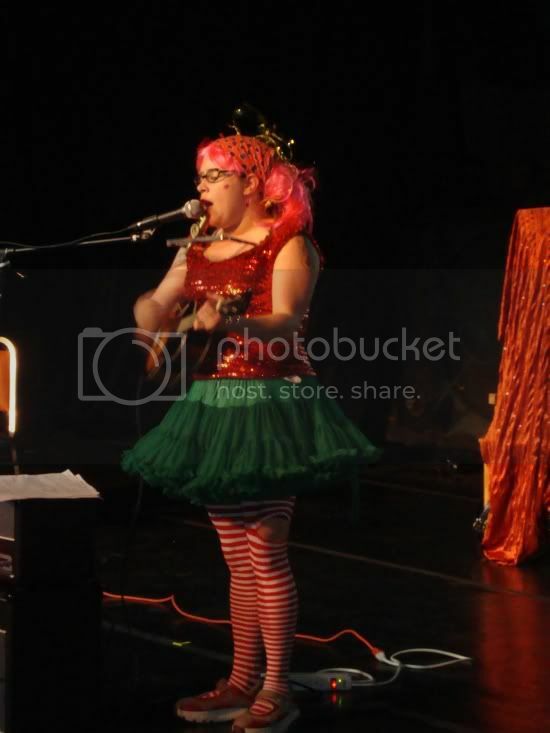 Anyway, another "sideshow" event was some crooning by Poopy Lungstuffing (aka Olivia Dvorak, who runs Super Happy Fun Land). She was great!